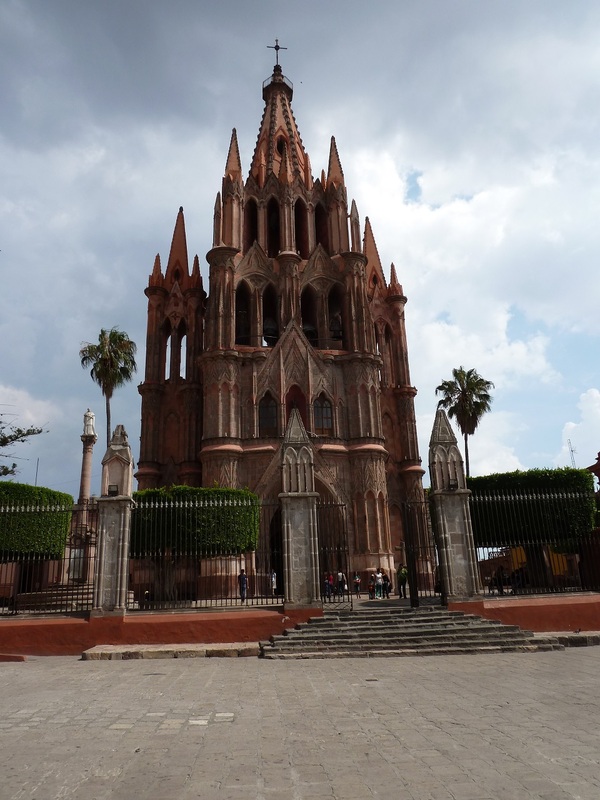 I’d heard lots of wonderful things about San Miguel de Allende. Mostly that it’s beautiful. I’d also received an open invitation to stay at a friend’s family home there, which by itself was enough to make me want to go. But the more I heard about San Miguel de Allende, the more I became interested in checking out its expatriate community. A few weeks ago I finally made the trip, and I found a town with two clearly separate communities – the Mexicans and the expats. Critics of Mexican immigration to the US often complain that the newcomers don’t integrate with US society. Well, this post is about what happens when US citizens (along with a lot of Canadians and Europeans) move south of the border. San Miguel de Allende, main cathedral. Photo by author. San Miguel de Allende is, indeed, a very pretty little colonial town, located a couple of hours north of Mexico City in Guanajuato State. Depending on who you ask, people say that anywhere from five to fifteen percent of the town’s population is foreign. 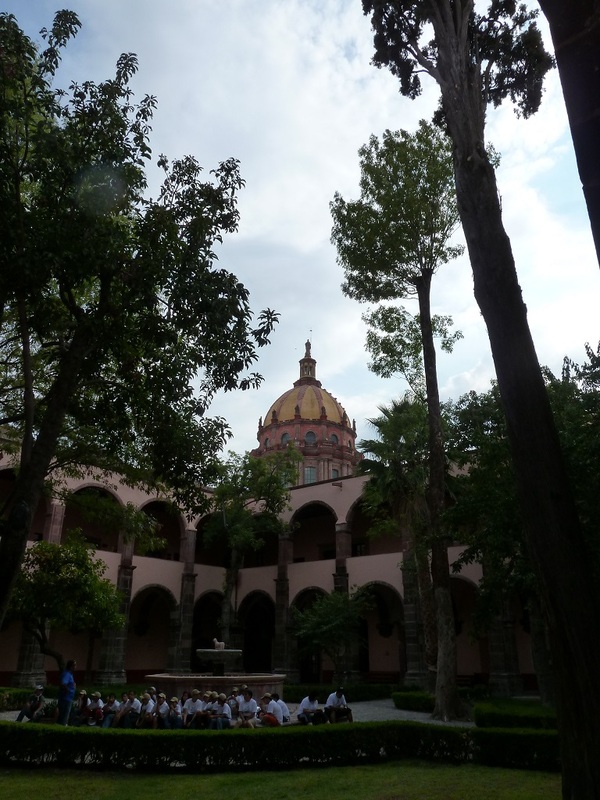 During the months before my visit I had met a handful of San Miguel de Allende residents in Mexico City. Two were US retirees and one was a Dutch performance artist. The history of San Miguel de Allende as a destination for expats has much to do with the founding of an art institute in the 1930s. A US American was appointed director of the school, and the influx of artists and writers that followed opened up a migration pathway that continues to this day. The same thing happens with lots of immigrant communities – they hear about the places that others have gone before them and they flock there. The modern San Miguel de Allende still has art students, but mostly it has retirees. I arrived in San Miguel de Allende in the middle of the afternoon. After wandering around the historic center for a bit and visiting Vía Orgánica, an organic café & store, I headed for my host’s house. Since my friend who’d extended an invitation wasn’t around, I’d arranged to stay with a host through Servas, an organization that promotes world peace and understanding by building a global network of hosts and travelers. Like Couchsurfing, but with a purpose. My host instantly became my connection to the expat community. An expat herself, there was a festive expat get-together underway when I arrived, carrying my backpack and what must have been a rather surprised look on my face. I’d gotten a bit lost on the way, and as a result had walked through a typical Mexican sort of cinderblock shantytown, only moments before walking in on a gathering where the wine was flowing and that could have been in Anywhere, USA. Perhaps not quite Anywhere – there was a Texan, one couple from Delaware and one from France and the US, and a few people from other US states. They told me about their activities in San Miguel de Allende – various Christian churches, local festivals, card-playing clubs, other clubs, charity organizations, restaurants. 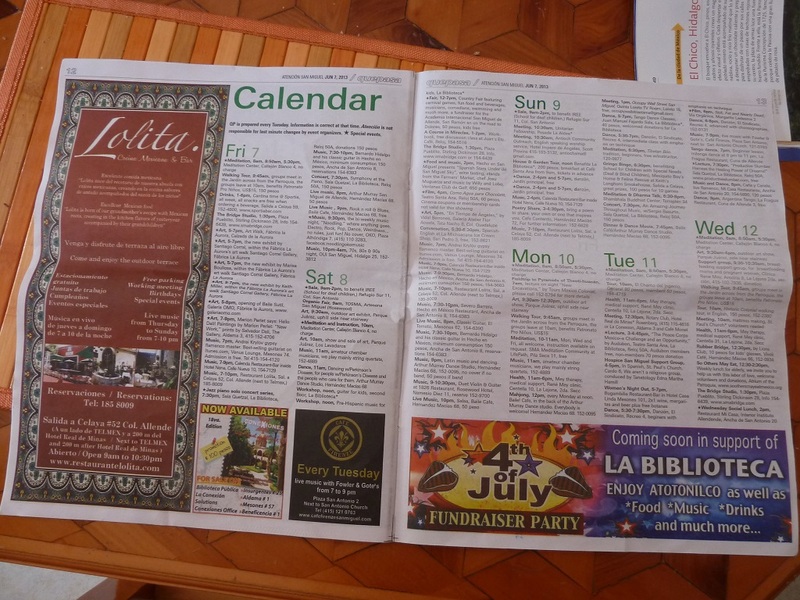 Local English-language newspaper. Ads include an upcoming 4th of July celebration. Photo by author. There were also some volunteer opportunities, which seemed like an interesting way to get a look at the interactions among, well, foreign locals and local locals. So the next morning my host dropped me off on her way to a meeting of the new local Humanists club and I made my way to the main cathedral. In an adjoining courtyard, I introduced myself to the volunteers of “So Others May Eat,” a weekly free meal open to anyone. The volunteers were all expats, mostly US retirees, and included a few Rotarians, since the Rotary Club goes to the event once a month. They showed me what to do, more or less, and I set to work slicing bread and making molletes, a sort of black bean sandwich. 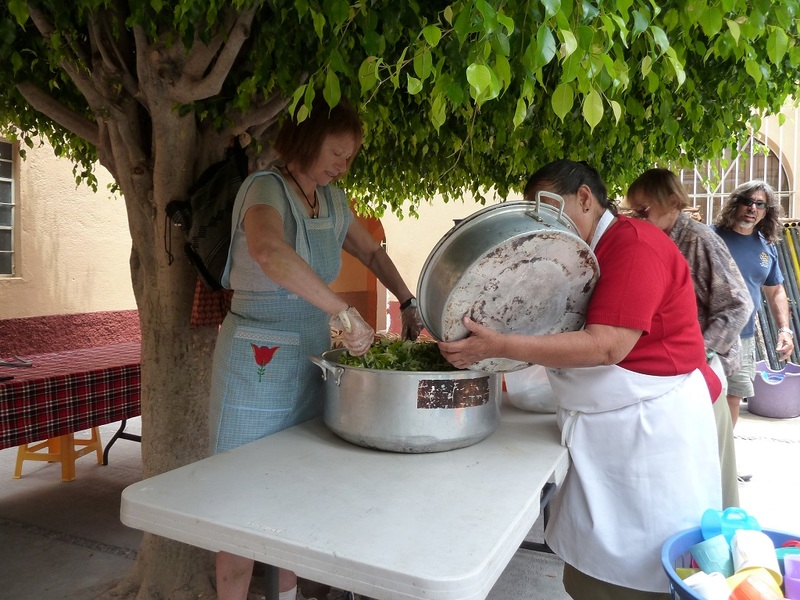 Expat volunteers prepare to serve a free meal in San Miguel de Allende. Photo by author. As the event progressed, I observed a few things about the volunteers and the Mexicans – mostly elderly and dressed in worn-out clothes – who came for the food. First of all, the two groups didn’t interact much. I mean, giving and receiving occurred, but they didn’t really engage each other. 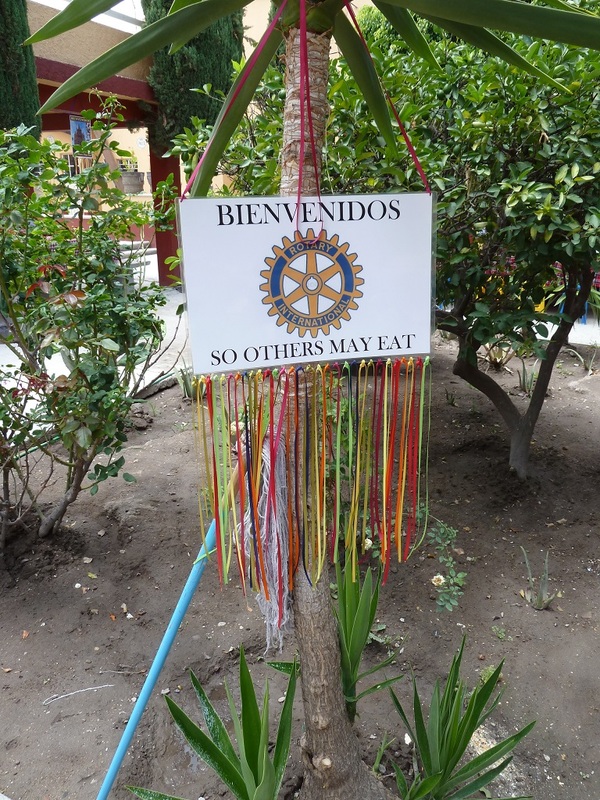 Most of the Mexicans greeted the volunteers quite graciously as they entered, and the expats responded as well as they could, sometimes noticing and sometimes not, preoccupied as they were with their attempts to prepare to serve the meal. At one point one of the volunteers became concerned about a large pot with something red in it, not knowing what it was or how it needed to be served, if it was to be served. I walked over and took a look, immediately recognizing the red substance as discarded hibiscus flower, which had been boiled to make a beverage for the lunch. It’s one of the most common refreshments in Mexico. The volunteer had been living in Mexico for about 12 years. As we served the meal and gave away the leftovers at the end, the language barrier also became apparent. The volunteers spoke to the people they were helping in broken Spanish or in English, nearly none of which the Mexican elders could understand. A volunteer said something out loud in English, directed at the other volunteers, about how it is difficult to deal with hungry people. “Welcome” The rest of the sign is in English. You can read it. Photo by author. Now, I understand that not everyone is going to be fluent in a foreign language, even if they move to a country where it’s spoken. But there is a kind of attitude, a social posturing, a state of receptiveness, that one uses when trying to understand another person. There is a different attitude and behavior that one uses when one feels threatened by an “other.” The people who came for the food could be seen as doubly “other” by the volunteers: Mexican and poor. Afterwards I spoke with one of the women who had come for the meal. Her husband had passed away soon after they married, so she and their children moved into the house inhabited by her widower’s parents, grandparents, sister, nephews and nieces. It was her job to make the tortillas – by hand, for nearly a dozen people, every day. That means buying the corn, soaking and cooking it for nixtamalization, taking it to the mill, shaping the tortillas and cooking them. Her stories of set me thinking of Mexico’s native corn, of the current anti-GMO movement, of NAFTA‘s destructive effect on traditional corn production in Mexico. I think, if I were living in San Miguel de Allende and wanted to get involved in improving the local community, I might consider organizing a movement against my own government’s contributions to local problems. As with language fluency, perhaps it is a lot to expect every expat to investigate the international relations and treaties between their native and chosen lands. But when you constantly see Coca-cola, Bimbo, Nestle, Pepsi, Tostito’s, Starbucks, and all the other companies you remember from back home, don’t you start to wonder? Is the population of San Miguel de Allende better off due to the expat community? You could look at economic growth and say, “yes.” They get jobs in people’s houses, in the tourist industry, in restaurants… They serve the expat community, and for that they get paid more than many of their compatriots. But while they might earn a bit more, the system isn’t such that by it they could actually hope to live the way the expats do. Not with the opportunities generated by the foreign influx. So is that better? Is that fair? The foreigners participate, but they don’t integrate. A courtyard in San Miguel de Allende. Photo by author. In San Miguel de Allende I found a community of expatriates from the US, Canada and Europe whose efforts to contribute to the local Mexican community (when they weren’t simply there to enjoy their retirement on the cheap), weren’t deep enough to challenge existing structures of exploitation and inequality. Perhaps, some might say, that’s too much to ask of the retirees who chose to continue their lives in a pleasant, vibrant and beautiful Mexican town. But the irony of the situation is that, to a slightly critical eye, their presence highlights the inequality and dependence inherent in the US-Mexican relationship. What is usually invisible to US Americans living in their own country is laid bare, in a remarkable geographical juxtaposition. What this experience, as with many others, makes clear is that prior to a change in structure, we need a change in conscience. If people do not abhor inequality, do not strive to understand others, do not yearn for a world without exploitation and privilege, then they will neither see nor seek to change the injustices happening before their eyes. I don’t want to end this article without mentioning that my host, the expats and “local” locals alike all treated me very kindly and generously shared their spaces and their stories with me. There was some reflection in a few of the conversations I had where we pried into the issue of the expats’ effects on San Miguel de Allende, and where there is reflection there is hope. What do you call a Mexican living in the USA? An immigrant. What do you call a US citizen living in Mexico? An expat. Thanks for sharing your thoughts and story, John. Linda’s experience as described in the excerpt from your book is a very good one to complement what I saw in San Miguel. It seems that life in Mexico for Linda has been a good change, and that she treads lightly on the community she has moved herself into. As I understand it, she moved to Mexico to escape a busy, stressful, unfulfilling life that she had built for herself in the US, based on the dominant societal definition of success. Her move to Mexico allowed her to live calmly, focusing on her personal development and on simpler, less materialistic pleasures in life. I’m not sure for how many of the 850,000 Americans living in Mexico that is the case.